Etching by Léonard Limosin, 24.7 x 18 S (New York; the four corners cut). Inscribed on the vase in the center: LL. Robert-Dumesnil/Duplessis, XI, 1871, 127.1. Herbet, IV, 1900, 328 (1969, 178), 1. Zerner, 1969, L.L.1, and xxxii-xxxiii, where it is suggested that Limosin’s compositions are of his own designs. COLLECTION: New York, 37.42.21 (probably from the collection of Prosper de Baudricour; see Duplessis, above, and Demartial, 1912, 21). Adhémar, 1938, 1, no. 1. Fay, in EdF, 1972, 291, under no. 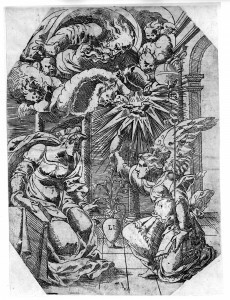 356, mentioned Béguin’s report of my association of the print with a drawing in Düsseldorf. 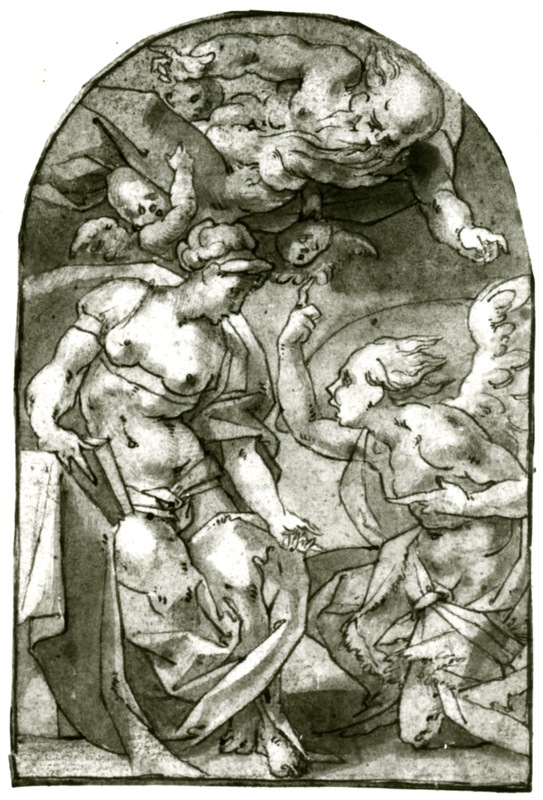 This etching, probably of 1544, the date that appears on Limosin’s other prints (see Zerner, 1969), is related to the drawing in Düsseldorf that is a faithful copy of a lost drawing by Rosso (Fig.D.83). On the considerable alterations made by Limosin, see the catalogue entry on the drawing and Chapter X. These changes are so numerous that it would be impossible from the print alone to make an evaluation of Rosso’s invention unless one assumed that Limosin worked from another drawing by Rosso in which Rosso, himself, re-worked his own composition. But the changes that appear in the print are of such a conventional kind – and were made, in part at least, to make Rosso’s image more decorous – that it is very unlikely that they can be attributed to Rosso. 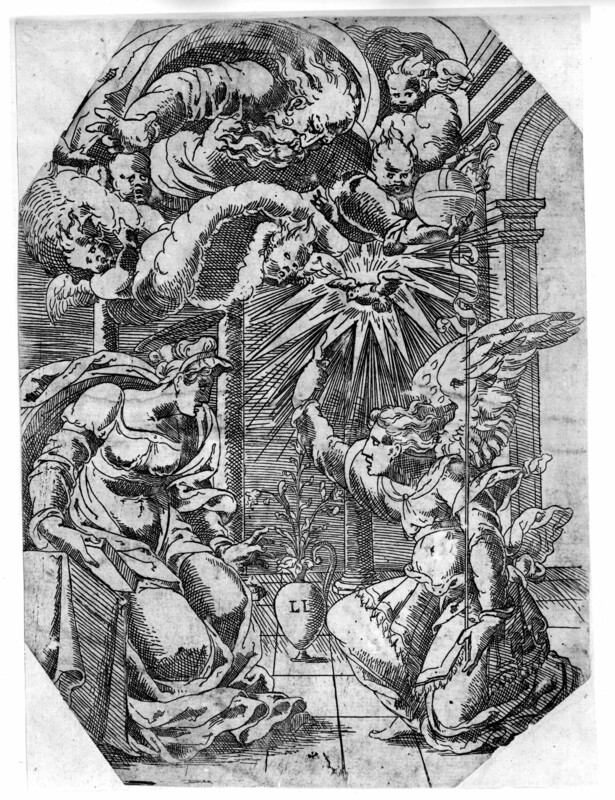 The vase of flowers in the print, while constituting a traditional iconographical detail of the Annunciation, is also related to Limosin’s coat-of-arms, especially as here it bears his own initials (see Verdier, 1967, 175, and the coat-of-arms in Limosin’s Christ Being Sent Away by Herod below, E.96). ENAMELS: Limosin. Écouen, Château, Musée national de la Renaissance, Cl 904A (Fig.E.90, Enamel). Oval, 34 x 26. LITERATURE: Du Sommerard, 1883, 362, no. 4617. Demartial, 1912, 19, Fig. 1, 22, 25, as reproducing Limosin’s print [which Demartial knew only from Duplessis’s description]. Baratte, 1993, 23 and Color Pl. 7. The oval enamel, which would seem to have been done in 1557, is closely related to Limosin’s etching, probably of 1544, but is not an exact reproduction of the rectangular print. God-the-Father flies in from the opposite direction, although the group to which he belongs is not entirely reversed, there is an elaborate canopied bed behind the Virgin, and a landscape with buildings is seen in the distance. Partially after Limosin. Martial Ydeux (signed: MD Pape). Limoges, Musée municipal de l’Évêche. Annunciation. 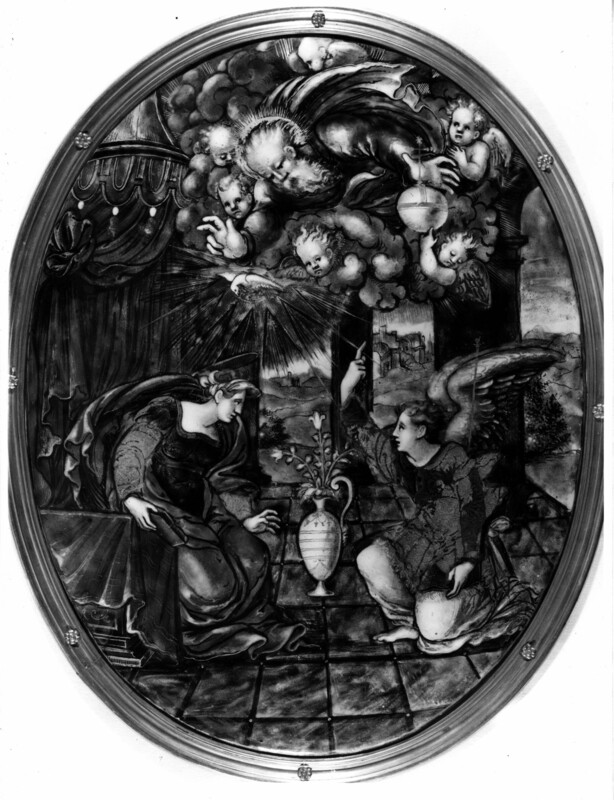 LITERATURE: Baratte, 1993, 23, 74, n. 22, notes that the figure of God-the-Father in clouds in this enamel is related to what appears in Limosin’s etching (Trésors d’email, exh. cat., Limoges, 1992, no. 20, Pl. 25).